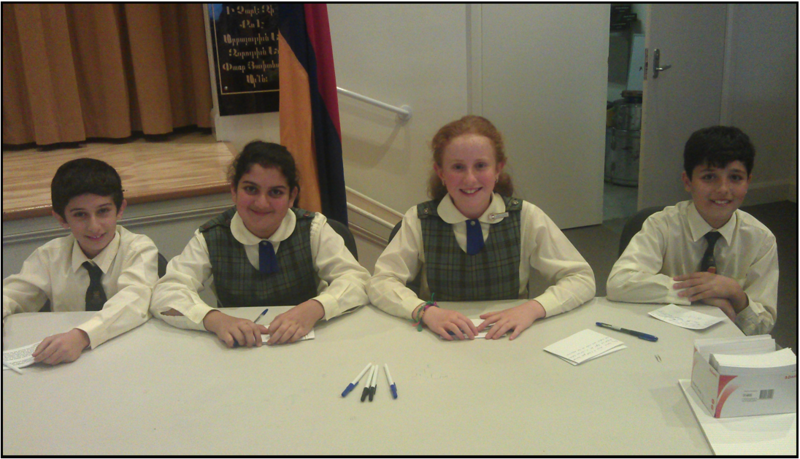 AGBU Alexander Primary School - Blog: 2ND DEBATE = 2ND WIN!! On Wednesday, Years 5 & 6 travelled to Galstaun College to present their negative side of the debate “We are responsible enough to choose what we eat.” Kevork, Jessica, Ani and Samuel were our successful team debating the German School. Our first speaker's arguments dazzled the adjudicators. Kevork spoke about the consequences of an unhealthy diet and the health problems that can occur such as dental issues and Diabetes. Our second speaker, Jessica argued about bad role modelling, tempting food advertisements and confusing nutritional information labels. We debated really well, following the correct structure for each speaker and rebutting the affirmative teams arguments. The second debate of the day was between John Colet and Sydney Japanese School. Their topic was "City children have the advantage." This was another interesting debate. The Sydney Japanese School was the winner. As it stands in the competition, Alexander Primary has won 2 out of 2 debates, John Colet has won 1 and Sydney Japanese School has won 1. A huge thank you must go to Mr Serge Manoukian who was able to help in our hour of need to transport our class to the debate. Our next debate is Week 8 on Wednesday 19th June.